This bill needs to pass in California. We all must realize that the CAI and AACM are looking out to make money. Arizona Department of Real Estate still has the following on their OFFICIAL WEBSITE as of September 28, 2017. HUD issues new regulations on HARRASSMENT. RANCHO BEL AIR PAYS NON-UNIT OWNER JONATHAN FRIEDRICH. Jonathan Friedrich is the creator of HOACorruption.com. A former Commissioner appointed by Gov. Sandoval to the Common Interest Commisson.. So you received a letter from a Debt Collector. Be sure to do the following. We are not lawyers and do not give legal advice but sending Certified/Return Receipt requested letters is a good way to protect yourself. Did you respond to the WARNING in the LETTER? It should have said something like this. This warning gives you the opportunity to dispute the balance. How would the Collection Agency know about the true amount owed? They have to take the creditors ledger as true. And then the homeowner has 30 days to dispute the debt and show that payments were made. Please, Please contact the Collection Agency in WRITING. Jonathan Friedrich files fraud suit against Rancho Bel Air in Las Vegas. SUPREME COURT DECISION IN FULL.. SEE HOW THE COMMUNITY ASSOCIATION INSTITUTE LOST. THE NRED OPINION THAT THE SUPREME COURT FOUND COMPELLING. Commissioner Friedrich claims his fellow Commissioners are unduly influenced by the HOA Industry. Read Las Review Journal article by Sean Whaley.. Attorney General agrees with Commissioner Friedrich. See next article. Attorney General takes following Collection Companies to court. I do have the case number and charges. Contact me at BobRobey@cox.net and I will send you the filing by the AG. Defendants: ATC Assessement Collection, LLC, Nevada Association Services,LLC, Silver State Trustee Services, LLC and Terra West Collections Group, LLC. plus Does 1 -10. PROVEN PARTIAL LIST OF HOA EMBEZZER'S in NV INFORMATION FURNISHED BY NRED. Rosemere Estates Property Owners Association Loses Battle to screw a homeowner big time. Please read the Lytle legal battle at this web site page.... COURT DECISIONS AND LEGAL FILINGS. Bob Robey on Camera: Channel 13 report on Garbage Cans. This web site is DEDICATED to restoring Civil and Constitutional rights to all individuals living in Common Interest Communities in Nevada and elsewhere as provided under the United States Constitution and Federal Laws, to change State Statutes through the legislative process, to stop intrusive and punitive actions, stop misuse of and to protect homeowners funds, limit the powers of abusive Board of Directors in Associations and expose abuses to homeowners. This site is a work in progress. It is meant to educate those seeking truth and justice in the HOA world. It already contains a tremendous amount of information. More will be added as it becomes available. Please visit the ARCHIVES SECTION to view /read about previous HOA Abuses, Law Suits & Corruption Stories. There is a "site" search engine in the upper right hand corner. Colonel Robert Frank and Tim Stebbins HOA OWNERS FIGHT BACK AFTER BEING ARRESTED FOR CARING ABOUT THEIR HOA. 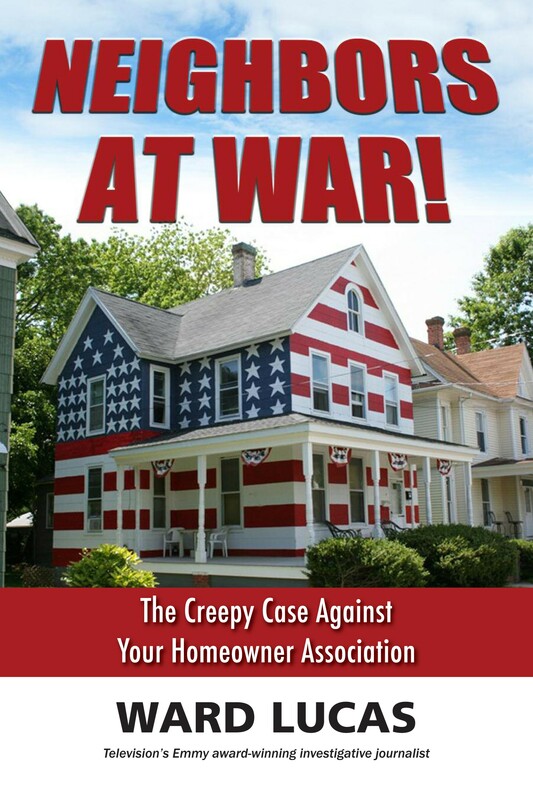 Neighbors At War is a critical examination of the modern Homeowners Association movement, and how it has robbed 62 million Americans of their civil rights as outlined in the U.S. Constitution. Homeowners often move into these planned communities and unwittingly sign documents that control their behavior in a multitude of ways. Failing to abide by these 'personality and private behavior' controls has cost thousands of homeowners their homes, their life savings and their peace of mind. While HOAs were theoretically created to protect property values, there is incredible incentive for HOA board officers to "go rogue" and unnecessarily abuse fellow homeowners. When that happens, neighborhoods are torn apart, property values plummet and lives are ruined. Another national scandal is the amount of financial corruption of HOA board members. In one American city, federal indictments of dozens of well-known public figures show what happens when HOAs go out of control. "the police insist such assaults and threats of violence are an association matter not of interest to law enforcement." Jonathan Friedrich has been appointed to the Commission for Common-Interest Communities and Condominium Hotels and will no longer be the Administrator of this WEBSITE called HOA Corruption. Mr. Robey is not an attorney but only a facilitator for the exchange of information to bring the problems of HOA Ownership into the Open. RANCHO BEL AIR VIOLATED STATE LAW 116.31151 BY NOT HOLDING A BUDGET RATIFICATION MEETING. VICTORY FOR THE PEOPLE IS CLOSE. THANKS TO THE FBI. HOA CORRUPTION IN NEVADA IS EXPOSED by Plea Deals, Suicides, House fires, Beatings and the hard work of the 4th Estate. It has taken the F.B.I. years to get to the point where the 4th Estate can tell the story. Today, We, the Owners of HOACorruption.com proudly present the well written articles of STEVE GREEN reporter for the Las Vegas Sun. PLEASE read the following 2 articles. Read how attorneys intimidated unit owners. Ask yourself, why didn't the Nevada Real Estate Division act when homeowners first complained. Here are the articles by Steve Green. HOA corruption in Las Vegas makes the Bloomberg press. Complaints rejected by NRED (Nevada Real Estate Division)? Excessive response time for resolution of your complaint by NRED?